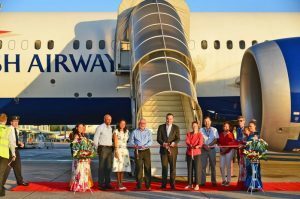 Victoria, Mahe (Seychelles) – March 26, 2018 (travelindex.com) – Seychelles on 25th March welcomed back British Airways with its direct, non-stop flight from the UK, which will be available year-round. This is a great plus for Seychelles and its tourism industry. Seychelles lost British Airways many years ago and, with it, the island’s direct flight to London. The service had been sorely missed by visitors and locals alike. The UK tourism market has been on the increase since the last couple of years after a long spell of stagnancy. British Airways should help to consolidate this key source market once again. British Airways is no stranger to Seychelles. For many of their years of service on the Seychelles route, it was Seychellois Vicky Lanza who was the local manager of the Airline. With her team, she strove to do all that was possible to keep the Airline’s flag flying high. After the departure of British Airways from Seychelles, Lanza was posted to the Airline’s Mauritius office. In other airline news, a total of 96 Air Seychelles Cabin Crew are to be made redundant and they will be joined by another 70 odd staff members from other departments. Letters of redundancy are expected to be issued today the 26th March. The National Airline’s marketing department has also been closed. No amount of explanations and excuses can mitigate the pain and suffering of these staff members and the disappointment of the Seychelles Tourism Industry. A few months ago, this publication raised concerns regarding the move by Etihad Airways to distance Air Seychelles from the airline. The Seychelles Government, as the major shareholder of Air Seychelles, approved this move and even went as far as saying it would not change anything. The Saint Ange Tourism Report met with a number of the staff members who are being made redundant, who said they felt that their years of devotion and loyalty to the National Airline meant nothing; they have been unceremoniously kicked to the curb. It was questioned whether foreign staff members had also been let go, just like their Seychellois counterparts, or whether they had been retained. An airline facing difficulties may be advised to concentrate on its core business. The news that Air Seychelles has formed a new partnership with CarTrawler technology platform to provide its passengers with ground transportation arrangements, amidst staff redundancy announcements, has not been well received in Seychelles. CarTrawler is an online booking service which aims to bypass the airport taxi queue system as it pre-books such services and will deal with their service providers. The Country is already facing challenges with different non-licensed service providers and this latest Air Seychelles arrangement will in due course bring more pressure on regulatory bodies. It is questionable whether this latest endeavour, under the circumstances, was strictly necessary. The priority should surely be to improve the existing system, improving the quality of service on board the aircraft, improving check-in counter experience and the telephone operator of the Airline’s answering services, as these personal touches impress the tourists more than anything else. Today, a telephone call to flight information outside the scope of 8am to 4pm results in a bland pre-recorded message reminding the public of the operating hours, which is not very helpful if a flight is expected to arrive outside of those hours. The Seychelles Taxi Association is monitoring the situation closely and intend to respond formally shortly, as their interests are directly impacted by this latest endeavour. They also intend to take up the matter with the Minister responsible for Land Transport and also with the Minister who has the oversight of Air Seychelles. Defending Assumption Island against world politics has united Seychellois for the first time for a single cause ever since since partisan politics divided the islanders in political colour groupings many years ago. People Power prevailed in the final hours and today Seychelles is breathing a long-held sigh of relief. Social Media posts and weekly peaceful protests in the heart of Victoria have created a momentum in Seychelles, prompting petitions to be signed and awareness to be raised in national and international media. Over 120,000 signatures today have been collected from concerned persons from near and far. Resentment and discontent amid Seychelles citizens are once again rampant following one of the public consultative meetings where it was made clear that the Assumption Island deal would go ahead with or without ratification by the National Assembly. Seychelles will continue to rally as one to protect its sovereignty. A Coast Guard for Seychelles is needed; this is not in dispute. However, it must be for the benefit of Seychelles and be managed by Seychelles. No amount of politicking can sway the public against their call for a referendum on the matter, especially given that the details of the proposed Agreement are public and its consequences have been understood. Our small Nation cannot afford to throw away its Non Aligned principle with Seychelles being the “friends of all and enemies of none” since 29th June 1976. Please take time to sign and register your support for the #SaveAldabra movement. Over 120,000 people have already signed the petition and you can help make the difference.